Are you getting married, but don't know where the planning should begin? Do you have ideas but don't know how to organize them into an effective timeline? Do you have it all covered but don't know Caterers, Musicians or Photographers? 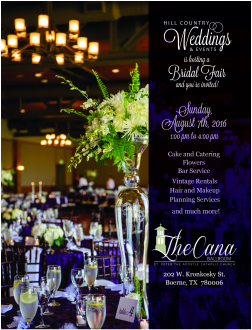 This Wedding and Event Fair lets you join us for an afternoon in the beautiful Hill Country where you can taste the best food, meet the best vendors and prepare for your special upcoming wedding. We're here to help you and THIS EVENT is for you. We believe every successful event starts with experienced planning and communication. but we can also just be there for your guidance as well. Our friendships, relationships with local hill country vendors, and proven experience, keep our weddings running smoothly and offer the ability to manage anything that may come up during your special day. With our guidance at Hill Country Planning, we can make any special event happen and your most memorable dream come true!